Let me share with you from the Four Disciplines of Execution what the authors feel are four Characteristics of a compelling Players Scorecard or as I prefer to call it a company, department or individual dashboard. In fact before I do, let me share with what the authors offered about building dashboards and scorecards so you don’t feel you’re the only one having challenges developing this concept. The whirlwind refers to the day-to-day activities we all are immersed in. Without choosing a priority to focus on, and I mean One Thing, the whirlwind always wins. Is it simple? It has to be simple. Think about the scoreboard in a football game. There are usually just six distinct pieces of data are displayed: score, time, quarter, down and distance, and time-outs. How many pieces of data is the coach tracking on the sideline? Lots more! The list goes on forever. Coaches need this data to manage the game, but the scoreboard on the field shows only the data needed to play the game. Can I see it easily? It has to be visible to the team. The scoreboard at a football game is huge and the numbers gigantic so everyone can tell at a glance who’s winning. If your scoreboard sits on your computer or hangs on the back of your office door, it’s out of sight, out of mind for the team. Remember that you are always competing with the whirlwind and it’s a tough adversary. Without a visible scoreboard, your top priority and lead measures will be forgotten in a matter of weeks, if not days, in the constant urgency of your day-to-day responsibilities (Whirlwind). Visibility drives accountability. 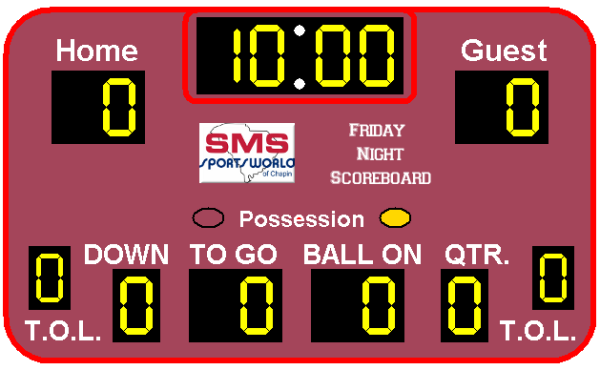 The results become personally important to the team when the scoreboard is displayed where it can be seen by everyone. Does your dashboard show lead and lag measures? It should show both the lead and lag measures. Bring your dashboard/scoreboard to life. The lead measure is what the team can affect. The lag measure is the result they want. The team needs to see both or they will quickly lose interest. When they can see both the lead and lag, they can watch the bet play out. They can see what they are doing (the lead), and what they are getting (the lag). Once the team sees that the lag measure is moving because of the efforts they have made on the leads, it has a dramatic effect on engagement because they know they are having a direct impact on the results. Can I tell at a glance if I’m winning? It has to tell you immediately if you are winning or losing. If the team can’t quickly determine if they are winning or losing by looking at the scoreboard then it’s not a game, it’s just data. Check your next report, graph, scorecard, or scoreboard before you dismiss this as obvious. Glance at the spreadsheets that show the weekly financial data. Can you instantly tell if you are winning or losing? Could other people tell? The authors call this the five-second rule. If you can’t tell within five seconds whether you’re winning or losing you haven’t passed this test. In essence, you and your team make a bet that you can move the lead measures and that those lead measures will move the lag measure. When it starts to work, even people who have shown little interest become very engaged as the entire team starts to see that they are winning, often for the first time. Keep in mind that their engagement is not because the organization is winning, or even that you as their leader are winning: it’s because they are winning. Many believe that engagement drives results, and so do we. However results drive engagement. When the team can see the direct impact their actions have on the results. Its Pearson’s Law again in action: "When performance is measured, performance improves. When performance is measured and reported back, the rate of improvement accelerates." Finally forty-three years later in another Harvard Business Review article, “The Power of Small Wins,” authors Teresa Amabile and Steven Kramer emphasize the importance of achievement to team members: “The power of progress is fundamental to human nature, but few managers understand it or know how to leverage progress to boost motivation.”16 We have learned that scoreboards can be a powerful way to engage employees. A motivating players’ scoreboard not only drives results but uses the visible power of progress to instill the mindset of winning. Every one of my clients has seen the power of what dashboards mean to the growth of their business and the power of engagement and momentum it builds once they established them and formed the discipline of accountability. Isn’t it time you discovered it as well? Irony. Counter intuitive business measures. All this discussion about business dashboards and execution would make you believe it’s pretty important. Here’s the irony. Execution is not why your business will fail. Yet the inability to execute properly is at the core of why your business can fail. We’ll explore this next blog.